Floods can result from events such as a storm, heavy rains, or a spring thaw, and can cause extensive damage and expense. In fact, according to the National Flood Insurance Program (NFIP), from 2007 to 2011, the average commercial flood claim was over $75,000. And many believe that climate change will make flooding events more commonplace in the future. Most businessowners policies exclude coverage for floods. That’s why it’s important to consider purchasing separate Commercial Flood Insurance. The NFIP offers flood insurance for businesses through private insurers, including insurers we represent. The rates are set by the NFIP and do not vary from one company to another. Coverage can be purchased for Building and Contents or Contents Only. Coverage is affordable, especially for businesses in moderate-to-low risk areas. 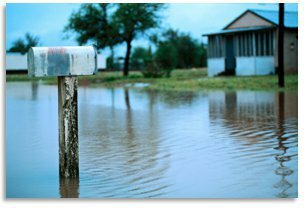 Typically, there is a 30 day waiting period between when a new flood policy is purchased and when coverage goes into effect. For this reason, it is important to put coverage in place well in advance of any forecasted storm event.